Serach at the Seder: A Haggadah Supplement by Maggid Yitzhak Buxbaum. 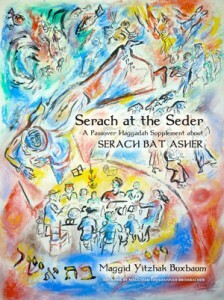 Have you heard of Serach bat Asher? Her name is mentioned in the Bible only one time, yet midrashim about her abound. Now Maggid Yitzhak Buxbaum has gathered all those midrashim into a supplement you can use at your Seder. (To read about other non-traditional Haggadot/supplements, analyzed by Jay Michaelson in the Forward, click here). Why at the Seder? Because, according the midrashim, Serach was not only among the 70 souls who went down to Egypt with Jacob, she also left Egypt with Moses! She was not only an eyewitness to the entire Passover story, she played an integral part in the Israelites’ redemption. How is that possible? Not to worry—Buxbaum explains all. The supplement’s narrative is divided between a leader, the voice of Serach and various other readers. We learn of the role Serach played. Wise beyond her 7 years, she sang to her grandfather Jacob the news that Joseph was alive, in a gentle way that would not shock him. In this way she brought him back to life, after years of mourning. As a reward, Jacob blessed her with never knowing death. The midrash says she lived hundreds of years and was taken up to heaven alive, like Elijah the Prophet. When Moses told the Israelite elders that he was there to redeem them, they went to Serach, who was the only one able to certify that Moses was the true redeemer; she alone knew the code words he would speak: “pakod pakaditi,” I have surely remembered you. Then, when the Jews were preparing to leave Egypt, Moses searched for Joseph’s bones. The Israelites had made an oath not to leave them in Egypt when God would take them out. But Moses could not find them until he went to Serach for help. She had seen how the Egyptians had put Joseph’s body in an iron coffin and dropped it into the Nile. To locate it, she wrote God’s name on a shard and told Moses to cast it in the river and call out, “Joseph the time has come. We are waiting for you.” After he did so, the coffin floated up. In both these instances, Serach was there to help redeem the Hebrews from Egypt. She was able to say “I was there,”—a refrain in the supplement—as testimony to what happened. The lesson, Buxbaum says, is for women, for memory, for iterating that each Jew, in every generation, should see himself or herself as if we had personally left Egypt. The supplement also suggests we should invite the wise woman Serach to our table just as we invite in Elijah. We should not forget that the Israelites were redeemed from Egypt in the merit of the righteous women—as they will be at the final redemption will also be in the merit of the righteous women. Buxbaum has created an original and inspiring addition to bring to the Seder. And Maggidah Shoshannah Brombacher has beautifully illustrated—in colorful, flowing drawings—the events that punctuate the Passover story of slavery and redemption. Yitzhak Buxbaum will be doing a beautiful presentation about this at the Manhattan JCC on April 2, 2017 joined by Maggid Neilah Carlebach, Devorah Segall storytelling and original music 2pm-5pm come join us! Bring Serach into your seder!